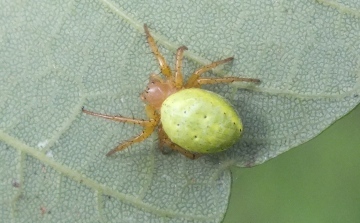 The above spider was found on a webstretched across the curled leaf of a sycamore. 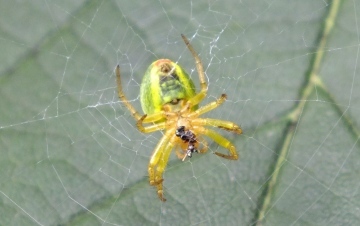 It was green with yellow stripes along the sides of its abdomen with four black spots on top. The legs were short with thorn like hairs. I feel fairly certain this is Araniella cucurbitna. Three had taken up residence in our compost bin, where they were, no doubt taking advantage of an abundance of fruit flies. One of them was unfortunately caught in the lid of the bin when I opened it. 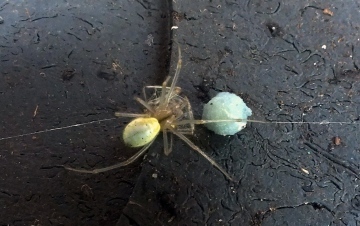 The second disappeared and the third took up residence and produced a blue/green egg case. 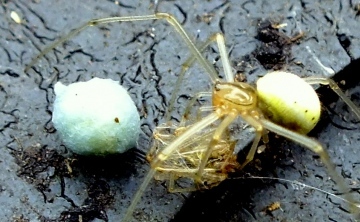 It had with it what appeared to be the remains of a spider encased in web which it guarded, covering it with its body. 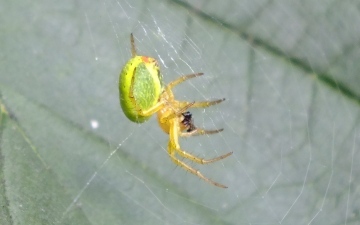 The legs of the live spider were long and glass like, the abdomen green with black spots. 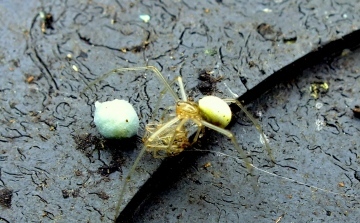 This could I believe be Enoplognatha ovata, but the colouration does not seem right nor does the situation it was found in. I would appreciate any comments and I.D. for these two please.